Fully Revised and Updated for the current exam! Due to popular demand we have created a CCNA Routing & Switching 200-125 Study Value Pack consisting of most of our CCNA v3.0 training materials for your CCNA 200-125 exam. Until now, these items were only available for purchase individually or as a part of our acclaimed CCNA Routing & Switching 200-125 kits. Now we have created our CCNA R&S Study Value Pack which provides you a value bundle price for getting all of them at once. 1) Our CCNA Lab Workbook v3.0 200-125 which will step you through 470 pages and over 70 different labs with explanations on what you are doing so you will fully understand the concepts. 2) Our CCNA Subnetting Lab Workbook which is 100 pages and will help you understand subnetting inside and out with informative explanations and tons of problems and scenarios for you to solve. • Comprehensive detailed explanations on why the answers are right and wrong! • Detailed scoring and ability to print your exam with explanations! So let's take a look below at a sample question from our exam simulator. Notice this is not the type of question you can memorize or brain dump. These are the types of questions that will help you pass your CCNA exam the first time! So download our free trial and after you like it, you can purchase it here! Free CCNA Exam Simulator Trial Download! 4) Our CCNA CRAM Sheet. This handy 3 page, front and back full color laminated CRAM sheet provides you a portable study center.Take it anywhere so you can easily review your CCNA R&S concepts without carrying bulky books.Especially bring it on exam day to do some last minute cramming before you sit your CCNA test. 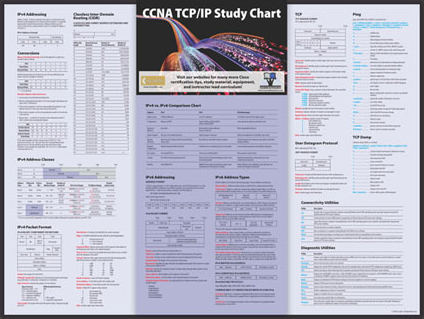 5) Our CCNA TCP/IP Study Poster .This color poster is great to hang in your cube or lab area.It clearly illustrates the TCP/IP protocol suite and provides a chart comparing IPv4 vs IPv6. We are sure you will love it! So take advantage of this offer to get all these items which normally retail for over $150 for the discounted price of $69.99! ***For a Limited Time you can add our $199 CCNA Video CBT to your CCNA Routing & Switching Study Value Pack for the low price of $50.00. Act now while the offer is still valid! We have just recently decided to make our CCENT, ICND2 and CCNA Boot Camp Study Guide eBooks an add-on option to our study value pack! These will be the theory component that fully supplements the CCNA 200-125 Lab Workbook. If you have wanted to attend a Cisco CCNA 200-125 Boot Camp but you just could not afford the $5,000+ for tuition and the week off of work? Then we have the solution for you! We are pleased to announce the availability of our CCNA Boot Camp Study Guide. This is the same study guide you would receive if you attend one of our CCNA boot camps. This CCNA study guide is 901 pages long and follows the format of an official curriculum book in that it has a Power Point slide at the top of each page and text describing the concept below it. So, how are we able to deliver this to you for only $39.99? It is delivered in a locked eBook format (this is to prevent illegal sharing as we spent over 1,000 hours creating it). We cover all the topics on the new CCNA 200-125 exam. Below we have outlined the chapters covered and provided a PDF sample chapter covering Advanced IOS Management. What is covered in our 470 page CCNA Lab Workbook? Below you will see listed all the labs in the workbook. Please note that depending on the routers and switches in your lab, you may or may not be able to fully complete every lab. 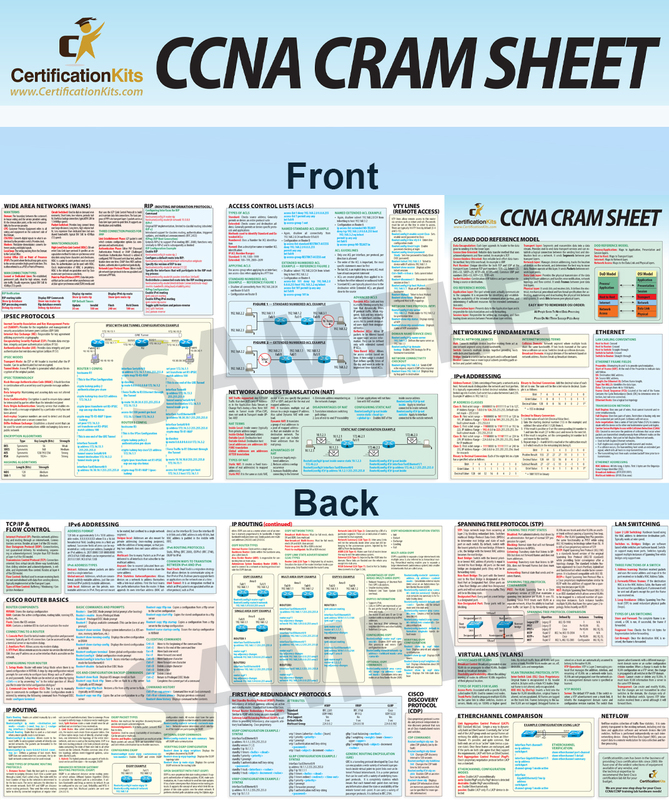 The Study Value Pack also includes our CCNA Cram Sheet! This is a fold out, laminated quick reference guide that is jam packed full of the essentials! This is the perfect companion to bring with you on exam day for the last minute crunch time! Last, but not lease is out TCP/IP Poster! This is another "cliff notes" style quick reference guide full of the best info! Stick it on your wall and let it soak in every day!